The worst thing about Summer has been the fact I have lost all of my weight loss mojo… it has literally vanished into thin air and I only hope that it will return again with a vengeance. Danone have helped me on my way slightly, as noticing that I like to generally kick start my day with a lovely yoghurt, arranged for me to try their latest range. Now, when I was younger I recall sitting down to a yoghurt from the Danone range for breakfast most mornings (thanks Mum!) so was naturally very happy to try the new ‘danio’ range. With the mention of ‘low fat and high in protein’ I was already optimistic… that means the range has to good for you… right? I popped off to Tesco to stock up and was greeted with 6 different flavours, (Peach, Blueberry, Passionfruit, Strawberry, Cherry and Raspberry) as soon as I saw them I knew I would like the yoghurts and Liv would like the pots for modelling! 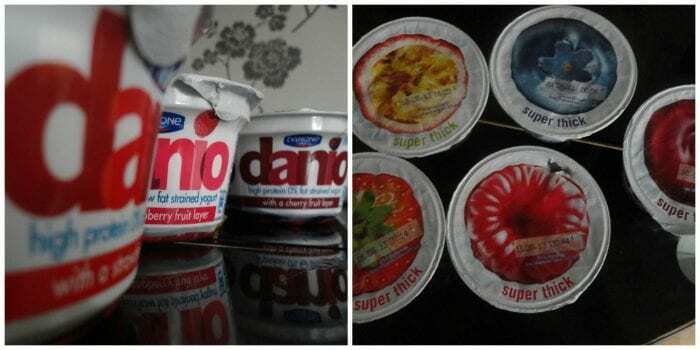 The Danone danio range is super thick – which I think is great, the yoghurts seem to fill you up more and you certainly take your time eating them. With a thick layer of the chosen fruit at the bottom, it’s great to mix the yoghurt up so that you get a tasty fruit hit with each spoonful you have. The yoghurts are thicker than normal due to a special way of straining that Danone use, it means they use more milk, making the yoghurts higher in protein. Even Liv liked them… to the point that I actually had to let her eat most of mine on a daily basis! I enjoyed kick starting my day with a Danio yoghurt and they have now become a regular item on my weekly grocery shop – for anyone on a fitness drive these really do help! I just have to remember to stay away from chocolate for the rest of the day! It’s not just eating healthily though, I’ve noticed a big difference when I keep to my usual exercise regime. Losing weight and toning up is so much easier if I keep walking my dog and jump on my bike every day – I can even watch Breaking Bad whilst I am doing it! Though really I need to look into something else, there has been talk of Heather and I playing netball. When we actually get around to it I know that if I keep fit with Reebok trainers, it will make it slightly easier due to my big plates of meat. The downside of being so tall I guess but I have always found that Reebok trainers give me a little more support, which when you have to learn how to pivot again is something to take into consideration! Go and check out the New Danone danio range for yourself – their Facebook page is a great way to keep up dated with all the latest promotions! Why Choose Blackpool And The Lakes For Your Holiday Home? I shall go check out their facebook page as my boys love yoghurt and this sounds really good for them. Oh yum, when it comes to yoggy I love the extra thick stuff! I love Danone and nothing in the world beats their raspberry yoghurt – fact! The raspberry danio is pretty awesome! !